At the beginning of the 11th century, these lands of the Ubierna valley were under the protection of Rodrigo's father, Diego Laínez. 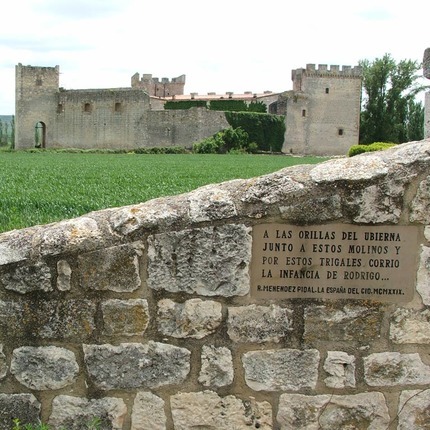 The border with the kingdom of Navarre was at the time a few kilometers north of Burgos, near Urbel del Castillo, less than 30 kilometers from Vivar. Some scholars have traditionally located the manor house of el Cid family where today is the castle of Sotopalacios (15th century) although there are no clear evidences to support this theory. The road to the castle takes us along the bank of the Ubierna river, where it is known that el Cid family owned some flour mills. Visits: the castle is privately owned and no visits are organized. From Sotopalacios there is a 10-minute walk along the banks of the Ubierna that reaches the castle.